Vietnamese website Tinhte has shared a teardown of Apple's new Lightning EarPods and Lightning-to-3.5mm headphone jack adapter included in the box with iPhone 7 and iPhone 7 Plus. The video confirms that, as expected, each accessory is equipped with a small digital-to-analog converter. 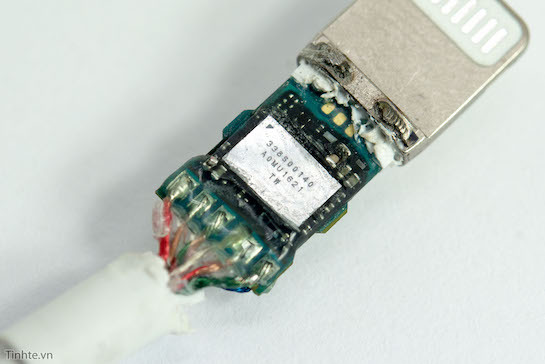 The chip in the adapter, labeled 338S00140 / A0MU1621 / TW, does not have branding for any particular manufacturer, but Apple typically sources its audio-related chips from Cirrus Logic, which produces digital-to-analog converters. The chip in the EarPods is nearly identical, with a label of 338S00140 / A0QK1623 / TW. The inclusion of a digital-to-analog converter, or DAC for short, enables both the new EarPods and traditional analog headphones with 3.5mm jacks to function over the Lightning connector, which delivers digital audio. The tiny chip is protected by a metal shield and two layers of plastic. Apple controversially removed the 3.5mm headphone jack on iPhone 7 and iPhone 7 Plus, forcing customers to use a growing selection of Lightning-equipped headphones like Apple's own EarPods, wireless Bluetooth headphones, or traditional headphones connected via the Lightning-to-3.5mm adapter. If there wasn't a DAC....how else would make sound? The strangest thing happened. I got my iPhone 7 on Friday, and despite it having no jack, the sun has continued to rise every morning. Who knew? It would literally be magical if it didn't include a DAC. You'd be amazed - I've seen quite a few posts suggesting that Apple had somehow changed the lightning port to output analog sound as it was "impossible" to include a DAC in the plug as there wasn't enough room! DAC includes "protection" so you only can play iTunes purchased music? The 3.5mm plug is a gold standard, there's really nothing wrong with it. But it's disgusting how Apple is trying to FORCE a change with this just so they can sell more headphones and make money through licensing the lightning port. So what, now we need to switch over to Apple's proprietary crap just because Apple wants to? Everyone can currently use their 3.5mm jack headphones and stick them into almost any other device... WHY does Apple want to pointlessly fragment this??? I'm somewhat confused... Not by the presence of a DAC in the lightning headphones, but by the presence of the third audio amplifier found previously in Chipworks' iPhone 7 teardown. An amplifier is used on an analog signal, but the signal leaving the port is still digital. What am I missing here? The third DAC is probably used to create thr hiss. A manufacturer of quality audio devices can now embed a better DAC in their device than was previously inside the phone. They couldn't do that before. THAT's the argument. Uhm, what? Of course you could. There have been external DACs and headphones with Lightning connectors long before the iPhone 7. Dropping the 3.5mm jack didn't add anything, it just removed functionality.